Are You Moving Exchange Journal Data to Office 365? If you’re moving a legacy email archive to Office 365, chances are good that you also have Exchange journal data to move as well. If you do, it’s likely that the total amount of journal data is equal to or greater than the total size of your email archive. With regards to Office 365, you might be wondering where the journal data is stored. It comes down to two possibilities; move the journal into the Personal Archive of an Office 365 active mailbox, or create separate Office 365 mailboxes (e.g. Journal Mail 001, Journal Mail 002, Journal Mail 003) and move the journal data for groups of custodians into those. This practice is called "journal splitting”. To many, an unknown concept that raises many questions, the most important being; is journal splitting the best practice for your organization’s regulatory or legal needs? The answer is it depends… Let’s break it down so you have all the facts before you make a migration decision on your journal. Companies that transmit data from Europe to the US have become vulnerable to unexpected financial costs from EU members. Brexit may be the most visible headline from the EU but a lesser-known threat poses more of a compliance concern. We reported last Fall about the potential fallout expected after the EU’s decision in the Schrems case invalidating the Safe Harbor Agreement and what US companies could expect were they not to change course before the EU’s January 2016 deadline. [i] Specifically, our concern was that an individual EU member State could impose its own rules and fine companies in the absence of a common plan subjecting US companies to potentially 28 different sets of privacy rules. Germany has now fired the first shot in this new privacy skirmish. Subscribe to the blog and get instant access to the crucial steps to ensure your cloud-based Office 365 migration goes smoothly. Should You Retire your Legacy Email Archive and Move it to Office 365? Many organizations are moving their Exchange email systems from on premise to the cloud via Office 365 to save cost, simplify operations, and increase ease of use and productivity for their employees. 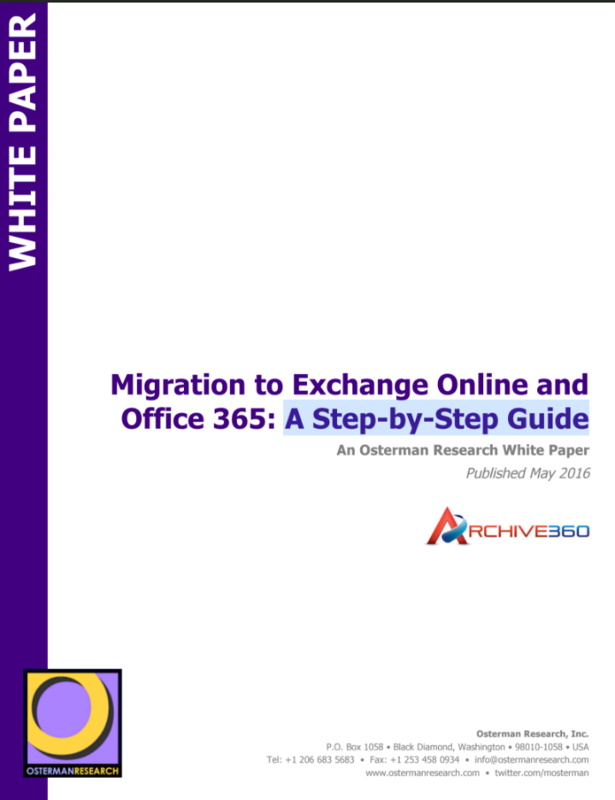 Migrating the contents of an on premise Exchange email system to Office 365 is straight forward and can be accomplished in a relatively short amount of time. But what if your organization also has an on premise legacy email archiving system as well? What is Grey Data and What Should Be Done with It? How much unstructured data does your organization actually have? Do you have any idea? Could you find and search through all of your organization’s data in response to an eDiscovery request or regulatory information request - quickly? What’s the downside if you can’t? Is Microsoft Inadvertently Blocking Your Road to Office 365? Microsoft FastTrack was designed to help you move your on premise Exchange email system to Office 365 “smoothly and with confidence”. But, when you read the “fine print” you discover that FastTrack will NOT migrate email archive data, including compliance-related journal data. The problem with this oversight is that most organizations planning to migrate to Office 365 similarly have a legacy email archive that should also be migrated. In fact, in a recent survey by Osterman Research, 64% of Office 365 migrations include a legacy email archive, so this lack of support is a major “road block” (or at least speed bump) to fully migrating to Office 365. Are you familiar with the concept of Exchange Journal Data? Many are not so let me give you a quick refresher. Journaling has been a mainstay of the Exchange Server for many years. In fact, it was introduced in a Service Pack for Exchange 2000 and has been a feature ever since. Journaling is enabled per mailbox and sends a copy of every message sent or received to a designated storage location, in many cases an email archive. Lawsuits have become a (high) cost of doing business for most organizations. Because of that, eDiscovery response should be proactively planned for to ensure the lowest possible cost to the company. What do Email Archives and Zombies have in Common? Believe it or not, email archives and Zombies have quite a lot in common. Below is my list of common archives/zombie issues. I would love to hear your horror story with regards to a legacy email that you’ve had problems with during a migration. Please submit below in the comments.